The Nike Air More Uptempo will return in yet another Chicago Bulls-inspired colorway with this Nike Air More Uptempo Scottie Pippen PE. For those that may have missed out on the Supreme x Nike Air More Uptempo release, this pair will be a lot easier to get when they debut this July 2017. Dressed in a White, Black and Varsity Red color scheme. This player exclusive Nike Air More Uptempo features a White leather upper with Black on the bold “AIR” lettering. Varsity Red contrasting accents covers the Nike Swoosh logos and Air pocket, along with Scottie’s “PIP” logo on the heels. Look for the Nike Air More Uptempo “Scottie Pippen” PE to release on July 6th at select Nike Sportswear retailers and Nike.com. The retail price tag is set at $160 USD. 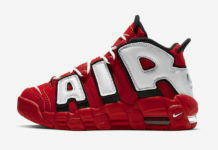 UPDATE: The Nike Air More Uptempo “Scottie Pippen” releases tomorrow overseas and at select Nike Sportswear retailers. The wider US release date scheduled for July 6th. UPDATE: Detailed look at the Nike Air More Uptempo “Scottie Pippen” that releases on June 29th via Renarts.